The Honor 8 runs on Android 6.0 Marshmallow, skinned with Huawei's Emotion UI, in its v.4.1 iteration. Emotion UI has been pretty consistent between versions and recurring Huawei users should feel right at home if upgrading to the Honor 8. There's plenty of stuff going on the lockscreen, starting with the alternating cover images - every time you wake up the device, you're greeted by a different wallpaper. That's if you opt for some of the Magazine unlock styles. You can also go old-school and pick a single image to be shown on the lockscreen. Whatever you choose, you likely won't be seeing much of it, as the fingerprint unlock will take you straight to the homescreen. If you do decide to wake up the Honor 8 via the power button, you get a large clock with a date, steps counter (if enabled) and a shortcut to the camera. You can also quickly start the camera by a double press of the Volume Down button. Back to the lockscreen, you can pull up an iOS-style menu from the bottom, where you get yet another camera shortcut, but also quick access to the flashlight, calculator and voice recorder. If you've chosen the magazine style lockscreen, the pull-up menu will give you eight more options for control over the changing covers. After unlocking you see a fairly standard Android homescreen with between 0 and 5 customizable shortcuts docked at the bottom and visible on all panes. There are eighteen homescreen panes at most, more than enough to house all of your apps since there is no app drawer. A pinch on the homescreen triggers the familiar Overview mode to let you check out and organize the homescreen panes currently in use, remove or add panes as you please. Widgets are available too - it's mostly the stock Android ones, but Huawei has thrown in some of its own as well. If you like your homescreens neatly organized, you can enable the shake feature, which will arrange scattered apps starting from the top left. Theme options are available in the Emotion 4.1 UX. They can swap your wallpapers, icon pack, and lockscreen style. The notification area has two panes - one that holds all notifications sorted in a timeline, and another for all of your quick toggles. 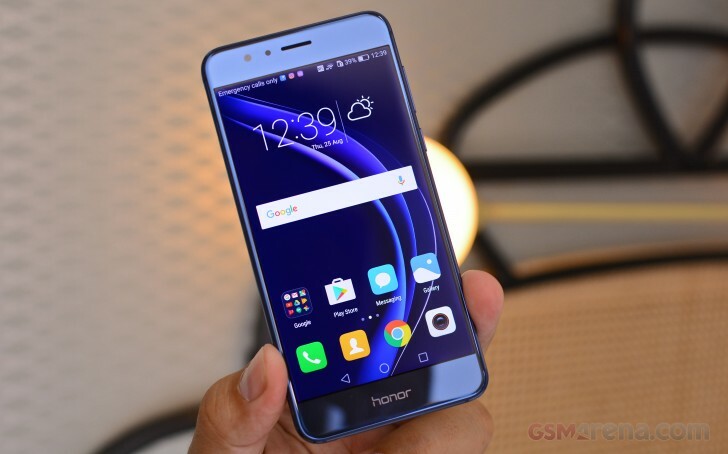 The Honor 8's task switcher lets you swipe up and away unwanted apps. A downward swipe locks the app so that when you hit the Kill all button, it remains open. That's nifty if you are trying to free some RAM for a particular app or game. For certain scenarios, like in-car use, you can enable a Simple homescreen mode, which features large tiles for easy tapping. It's not particularly consistent, though, offering simple version of some menus, but not others - the dialer is the same size as in regular mode (in all fairness it's fairly oversized to begin with). Huawei had granular control over app permissions before it was cool, and there's no reason to change that, now that the feature comes as a part of latest Android Marshmallow. The Honor 8 features a notification center, courtesy of the Phone Manager app, from which you can control which apps can send you the three types of available notifications - the shade notifications, the lockscreen notifications and the banner style notifications. This level of control is also employed when it comes to the app access to network data. The user can control the rights of each application to access either WiFi or mobile data. This can save a lot of traffic and help you optimize your data plan and consumption in an easy and convenient way. The Phone Manager also features harassment filter, battery manager with power-saving modes, and options to choose which apps to run in the background and which not (protected apps). As part of the extensive Smart assistance package, you can customize the bottom navigation bar - you can swap the task-switcher and back keys, or even add a shortcut for the notification area. There is also a one-handed UI mode, for easier menu surfing on the go, although it's hardly essential on a 5.2" screen like the one on the Honor 8. The fingerprint sensor on the back is also a clickable key (Smart key), on which you can assign up to three quick actions invoked on single press, double press, and press&hold. You can assign app shortcuts, as well as actions such as torch or screenshot. You can enable the so-called Floating dock - it's a virtual key you can move anywhere on the screen, allowing you to expand it to the primary Android keys - Back, Home, Task Switcher, Lock and Close all running apps. It will help you control your phone with just one hand. Motion control also plays a significant role on the Honor 8. There are flip gestures, as well as picking up, tilting and even things like knuckle detection and drawing. All of those are extensively customizable to your liking as well. Scheduled power on and off is also available. The Smart Assistance package also offers Glove mode, and an option to prevent accidental unlocks while the Honor 8 is in your pocket. Voice control, on the other hand, lets you operate the Honor 8 entirely hands-free. It lets you trigger a voice command, even when the phone is locked, and its screen is off. The Honor 8 does this by always listening for a "trigger word", which by default is... "Dear, Honor." Once triggered, the phone wakes up and awaits further voice instructions, like placing a call. Speech awareness is also customizable. The wake-up phrase can be changed, and you can also train the device to recognize your voice better.